Q. What are the challenges of managing projects in your environment? A. Erecting and commissioning Transmission Tower (TL) projects is one of the most complex project environments. It involves erecting towers across vastgeographical expanses, many times on private land; so legal hurdles can derail the project. In addition, there are conflicts between how the plant would like to supply and how the site wants to erect the towers. Customers (Government bodies or PSUs) play a major role in execution as they supply part of the material and every major step in execution like creation of BOQs, material dispatch etc., requires customer inspection and approval. Q. What key paradigm changes were implemented? A. Earlier, we managed operations to meet monthly and quarterly turnover targets and we realized that this led to poor subordination to site requirements. We switched over to working for overall project flow and turnover became resultant effect. To give you can example, previously our priority for supplying material was large batches of ‘A’ type tower which are easy to make and can fetch turnover in the short run, now we focus on supplying assorted towers to assist fast stringing at site. This called for dramatic changes in manufacturing, procurement and management thinking. Q. 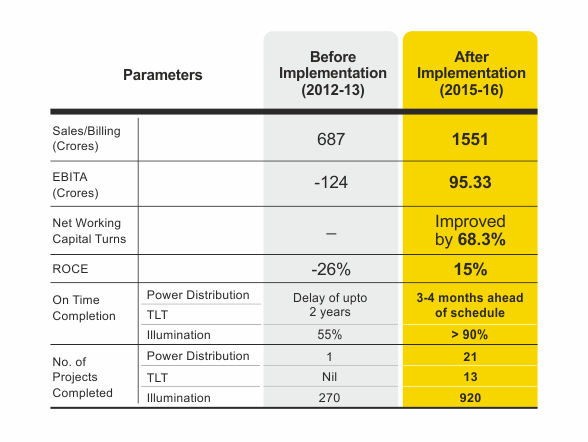 Was the implementation journey difficult? A. We began implementation in April 2012 with Vector Consulting Group as our consulting and implementation partner. We had a huge number of open projects with severe delays and overruns. We had a challenge of closing all old projects and simultaneously putting proper processes for new projects. Closure of chronic old projects called for extra expenses and write offs. The Projects division almost wiped out the profits earned by other divisions of the company. We had to bite the bullet. We closed a record number of sites in one single year. At the same time we put in flow processes for new projects. Every new project is well ahead of schedule. Power Grid has recognized us, as the best in project execution, in category of TL tower projects unto 765KV. Q. When can one expect operational results to translate into financial results? A. We have focused on flushing out old projects in the last two years, so profits have taken a beating. The portfolio is getting cleaner with new projects – this should translate into better profits next year. On top line we are growing by more than 75 percent, but with the new paradigm of synchronized supply to sites. The working capital has been reduced by more than 50 percent. Next year this will improve further. Q. How did you handle external conditions? A. We realized that when your own house is in order, it is much easier to control external variables. 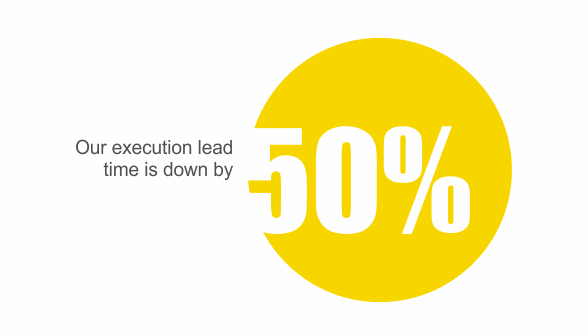 For example speed of execution reduces chances of legal issues as compared to a situation when sites remains open for too long. We are also able to expedite with our customers as the agency-causing delays becomes very obvious.